M821 Bridge Transporting Stake Truck WO/ W.
The M809 series utility truck is based on the original M54 series design, that was produced in early 1950's and remained in production and use for over 30 years. In the 1980s the M809 series trucks were not replaced but were supplemented with the much improved M939 series. 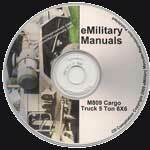 The M809 series trucks were eventually replaced with a new MTV (Medium Tactical Vehicle) family of 6x6 utility trucks.